Sometimes in New York you come across a building that’s trying to tell you something. Take this red-brick tenement on the corner of Second Avenue and 109th Street. 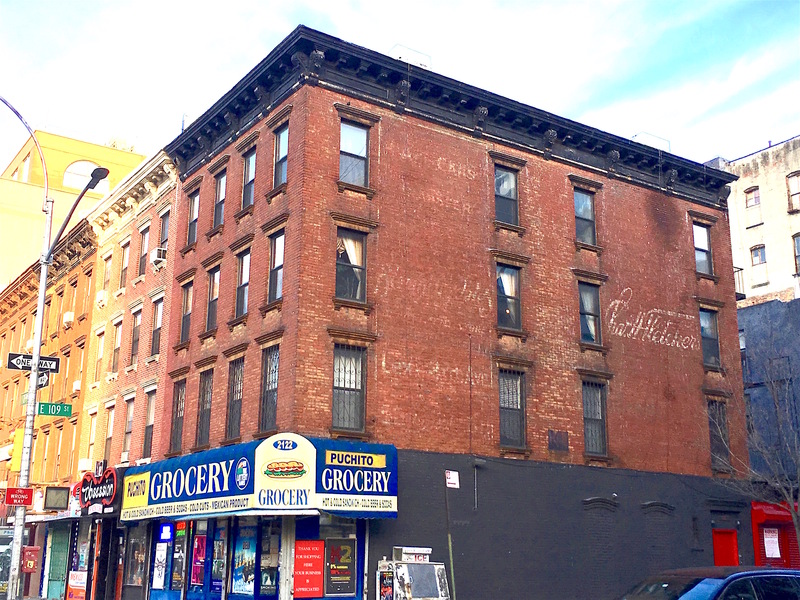 At some point in the past, ads were painted on the facade—designed to catch the eyes of Second Avenue El riders and pedestrians in a neighborhood that was once a Little Italy, then became Spanish Harlem by the middle of the century. Now, perhaps nine decades later, enough faded and weathered paint remains to give us a clue as to what the ads were about. The ad on the right side of the facade might look familiar to faded-ad fans; that familiar script used to be painted all over the city. Fletcher’s Castoria was a laxative produced by Charles Fletcher all the way back in 1871. 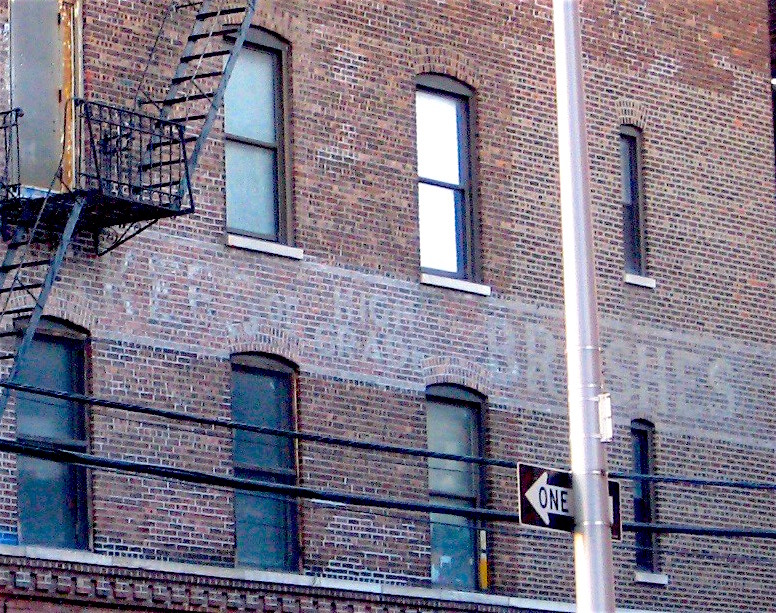 The company promoted the product until the 1920s with ads on the sides of buildings, a few of which can still be seen today. 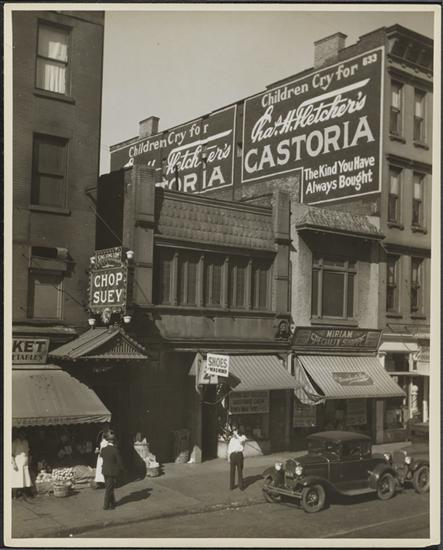 This photo taken by Charles von Urban (part of the digital collection of the Museum of the City of New York) shows a similar ad on East 59th Street in 1932. 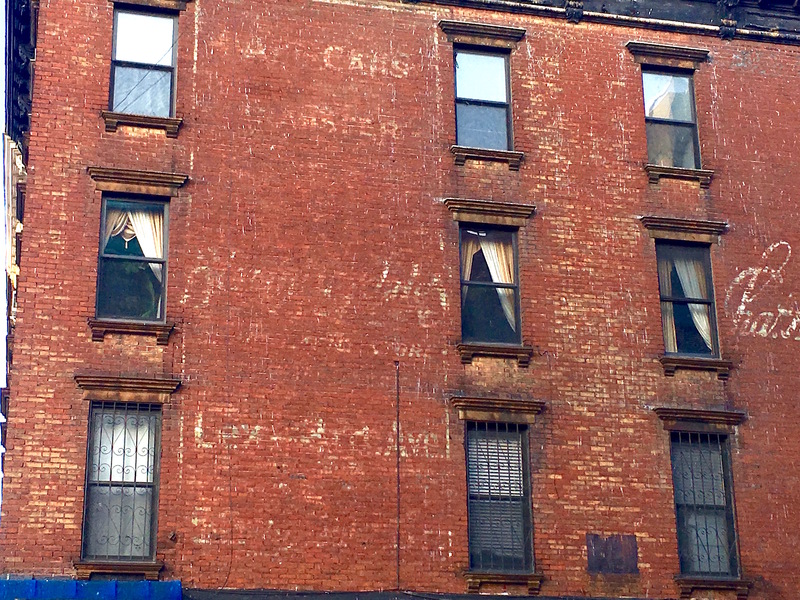 The ad—or ads—on the left side of the tenement are harder to figure out. “Lexington Ave” is on the bottom, and it looks like the word “cars” is on top. A garage? A gas station? For a while I thought the word in the middle might be Bloomingdale’s, a good 60 or so blocks downtown on Lexington. There was—and maybe still is—a very faded Bloomingdale’s ad on a building at 116th Street and Lexington. Exactly what riders and walkers saw when they passed this corner is still a mystery. On a brick wall next door to a strangely suburban-looking Marriott Hotel is a relic of New York’s piano manufacturing days. 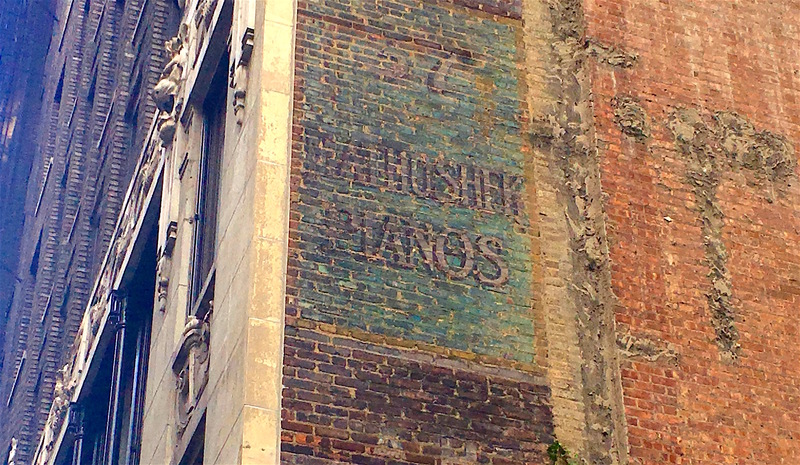 Squint and you can make out this fading color ad for Mathushek Pianos, founded by Frederick Mathushek, who had been building pianos in New York since 1852, according to Antique Piano Shop. 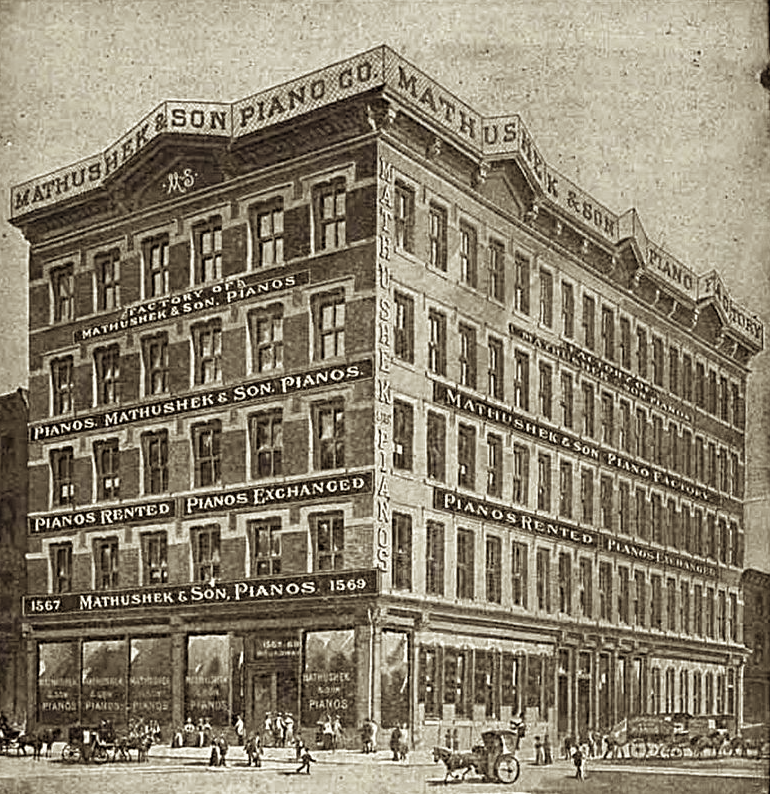 Mathushek Pianos hopped around various addresses in New York City in the late 19th and early 20th centuries, when having a piano in your parlor was quite a status symbol. For a short time, the company had a showroom or office at 37 West 37th Street, according to faded ad site 14to42.net, where New Yorkers went to buy Mathushek’s prized square uprights. A Mathushek factory occupied the corner of Broadway and 47th Street at the turn of the century, smack in the middle of today’s Times Square. 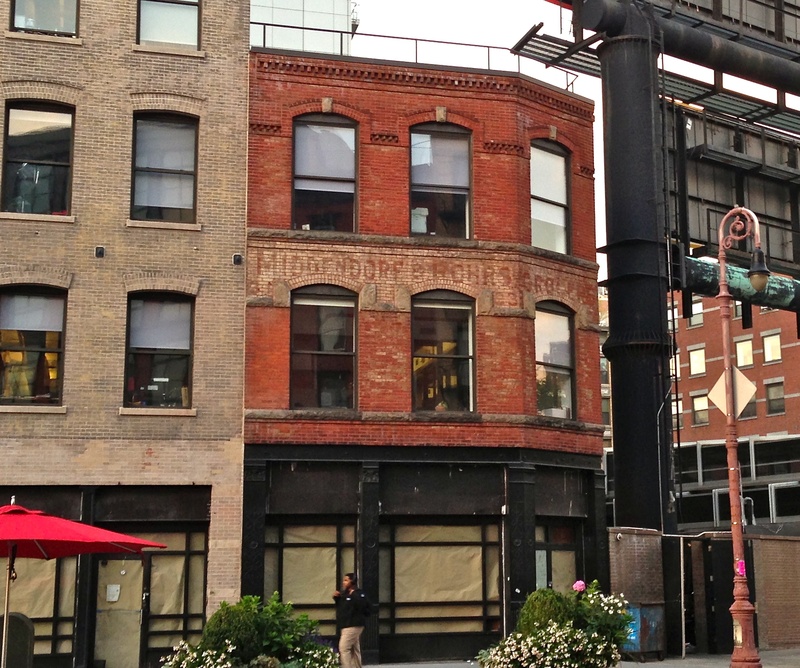 Ads for pianos can still be found in the city’s corners—like this one in downtown Brooklyn. 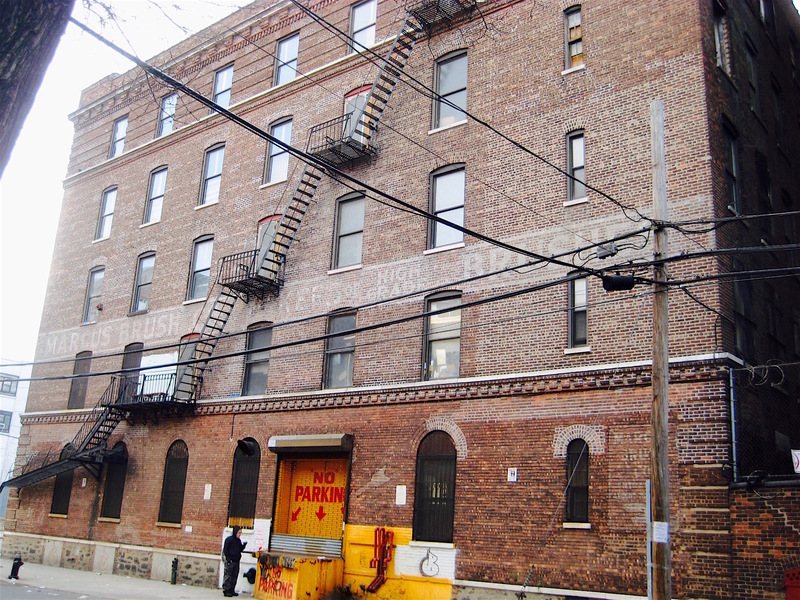 A century or so ago, red-brick factory buildings in every borough of New York City hummed with the sounds of workers and machinery — producing everything from ketchup to wallpaper to pianos to candy. These days, the red-brick factory is an endangered species. 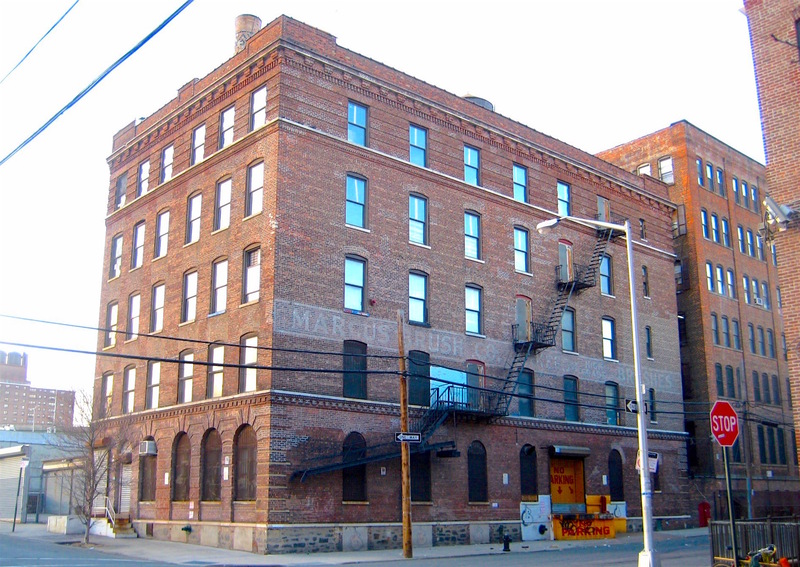 If they haven’t been bulldozed or turned into luxury apartments (a Lifesaver factory in Chelsea has been rebranded the “Lifesaver Lofts“), they sit empty and forlorn — the company name barely discernible on the facade. 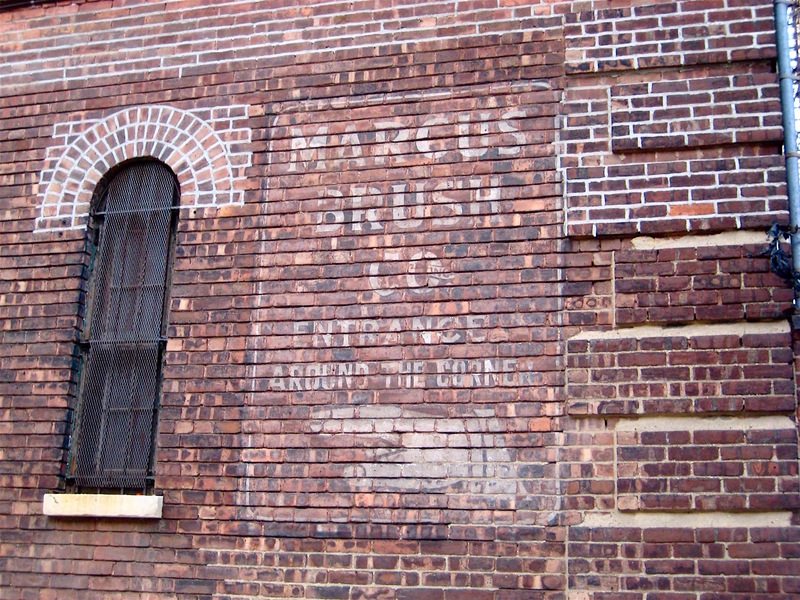 The Marcus Brush Company building is one of these factories. The hauntingly beautiful structure is on Willow Avenue and East 135th Street in Point Morris, a South Bronx neighborhood three stops from Manhattan on the 6 train that was once a manufacturing hub. Marcus Brush moved here in 1925, according to Walter Grutchfeld’s well-researched photo website. The company went bankrupt five years later, but another brush company called Acme took over and remained there, possibly through the 1970s. Perhaps the old factory is in use today. But on a recent visit, it seems as deserted as the rest of Willow Avenue, a building with no pulse and a smattering of graffiti on one side. Considering that Point Morris is making something of a comeback these days — a brewery and distillery occupy nearby spaces — the Marcus Brush factory will probably come back to life soon. 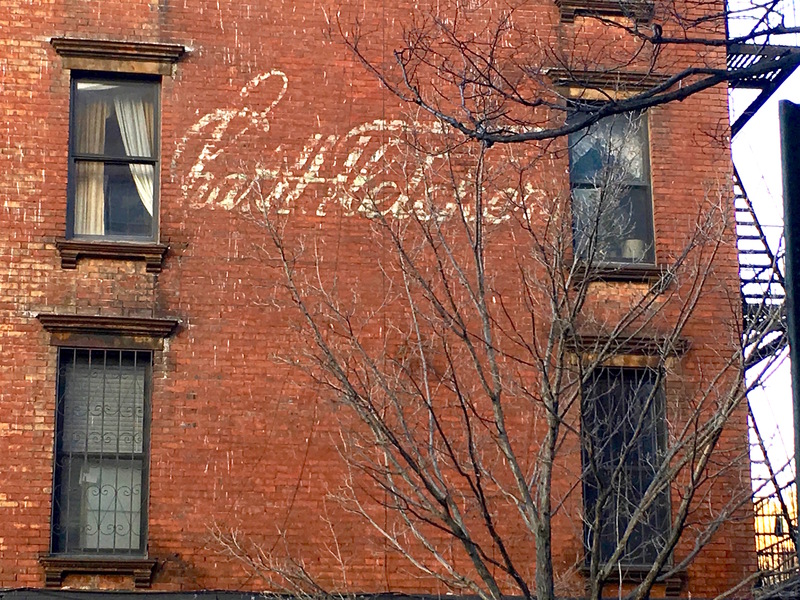 It would be wonderful if the faded lettering on all sides isn’t wiped clean, and that it remains a reminder that in a different city, people made “high-grade brushes” and a living behind these faded brick walls. What’s left of Little Italy these days has been described as a tourist trap of restaurants, pastry shops, and knickknack stands. But something about this two-story ad makes me pine to go back 100 years, when Mulberry Street was the center of an enormous neighborhood stretching from Houston Street to Columbus Park, busy with specialty food shops, peddlers, vendors, crime family social clubs, and 10,000 people at its peak. 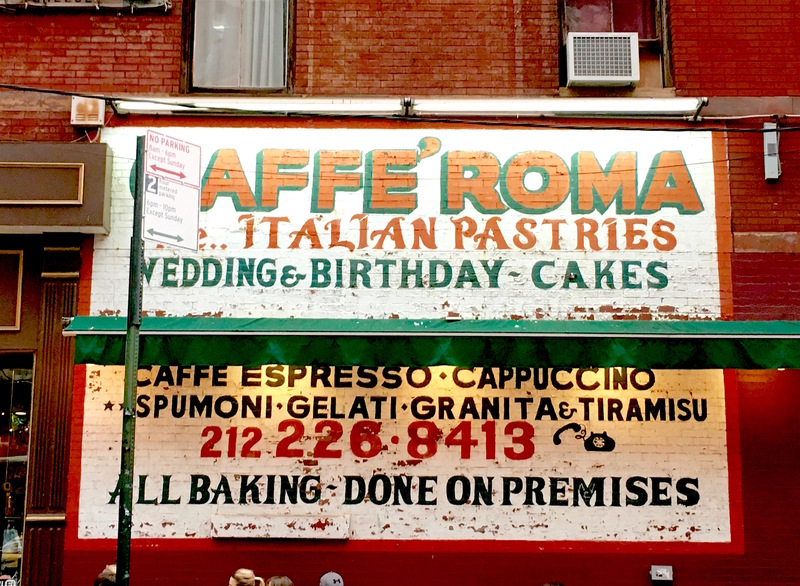 Caffe Roma was there in those storied days; the place has been serving espresso and treats since 1891. 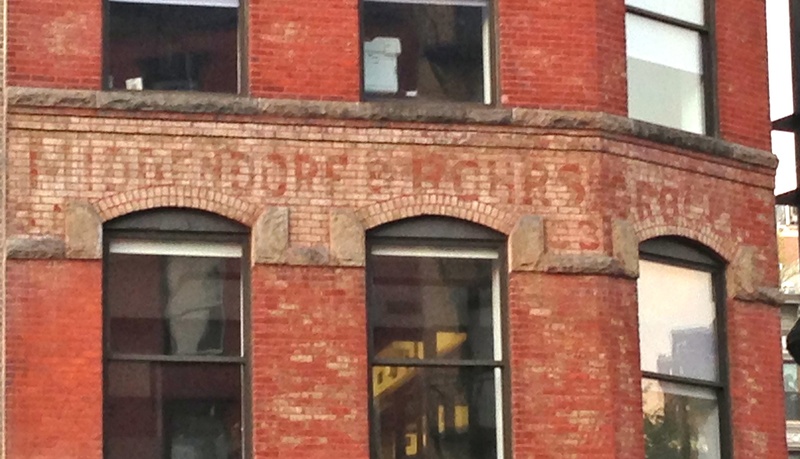 From the 1890s to the 1960s, grocers Middendorf & Rohrs operated a wholesale store out of this red-brick building at One Little West 12th Street. The grocers are long-gone, of course, like the rest of the wholesale markets (including Gansevoort Market down the block) that once called this grimy stretch of Manhattan home. But what a treat to see that the name of the place is still visible on the facade! Hmm, could this Rohrs be the same Rohrs who opened the beloved (and recently shuttered) coffee emporium on the Upper East Side in 1896? 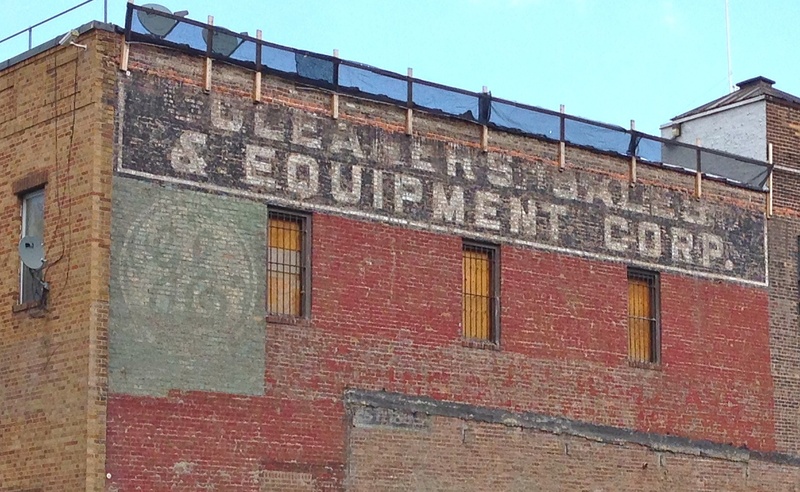 On Kent Avenue is this well-preserved reminder that Williamsburg was once known for its industry and factories. And the bonus faded ad: a GE logo! Cleaners Sales & Equipment Corp was in Williamsburg at least into the 1990s. There’s an address for it in Orangeburg, New York now. Frank Jump has a little more company background. The white-brick residence at 155 East 38th Street doesn’t appear to be any different than the hundreds of others like it in Manhattan. 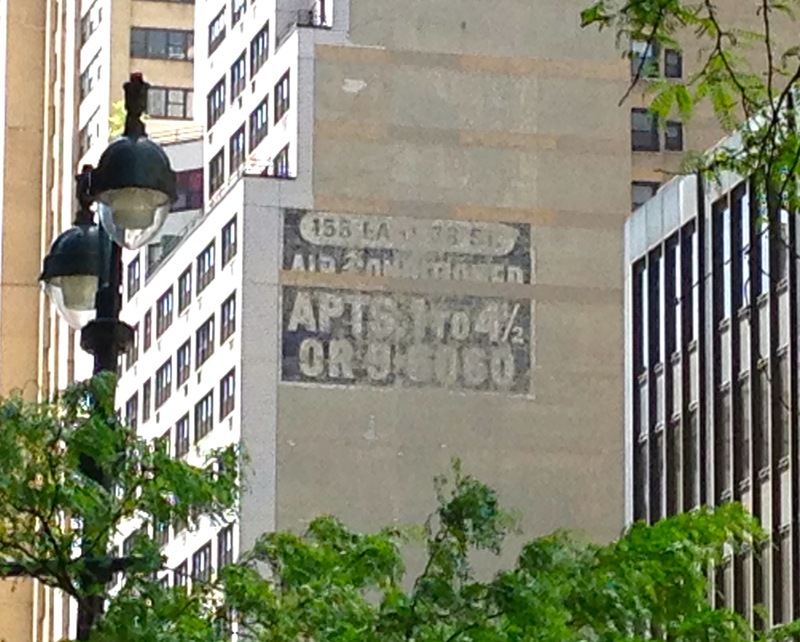 Except for one thing: the north side of the building sports a super old-school ad for apartment vacancies—air-conditioned, from 1 to 4.5 rooms! The old OR exchange stood for ORchard, indicating a Lower East Side realty office ORegon. Isn’t it a beauty? 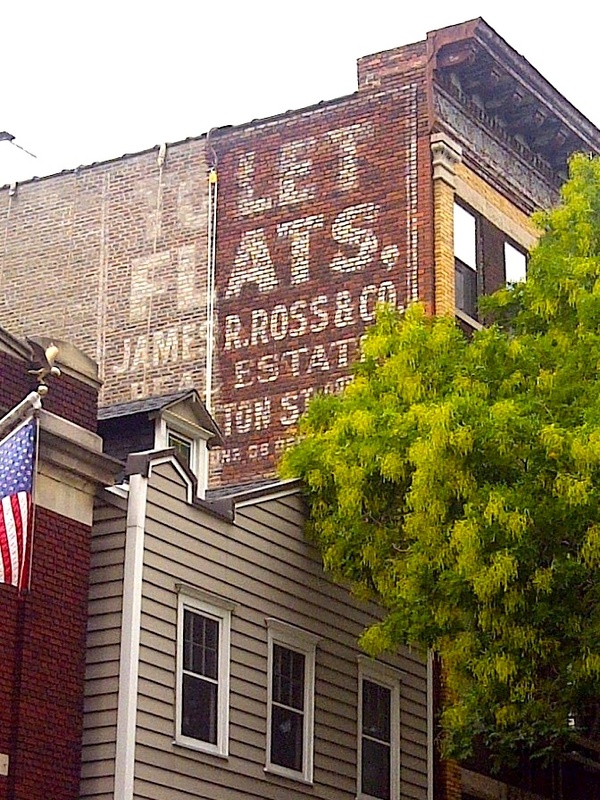 An Ephemeral reader sent in this photo of the lovely “to let flats” ad at 70 Middagh Street in Brooklyn Heights. As wonderfully preserved as it’s been for so many years (how many exactly, I have no idea), recent construction work has worsened its weathered, faded appearance. What a shame. You can’t miss this slice of the old-school city at Delancey and Allen Streets: a colorful ad for a fabric emporium launched in 1910 by a Polish immigrant pushcart peddler selling rags. 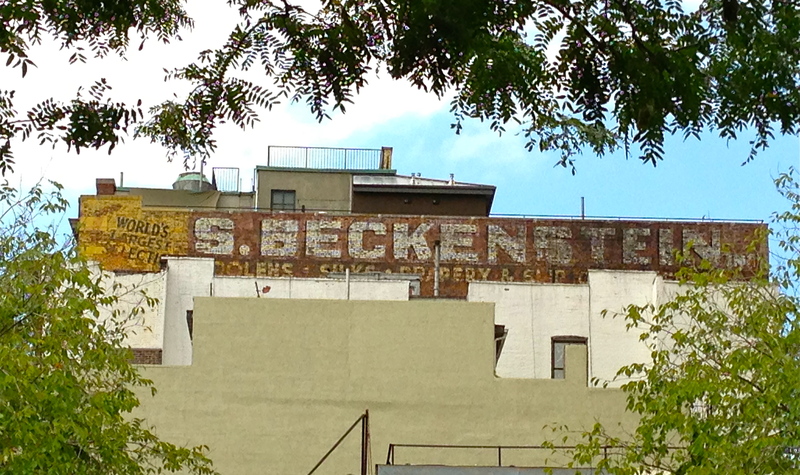 Beckenstein’s Orchard Street home is apparently closed; the business relocated over to 32 West 20th Street. Luckily the sign remains. 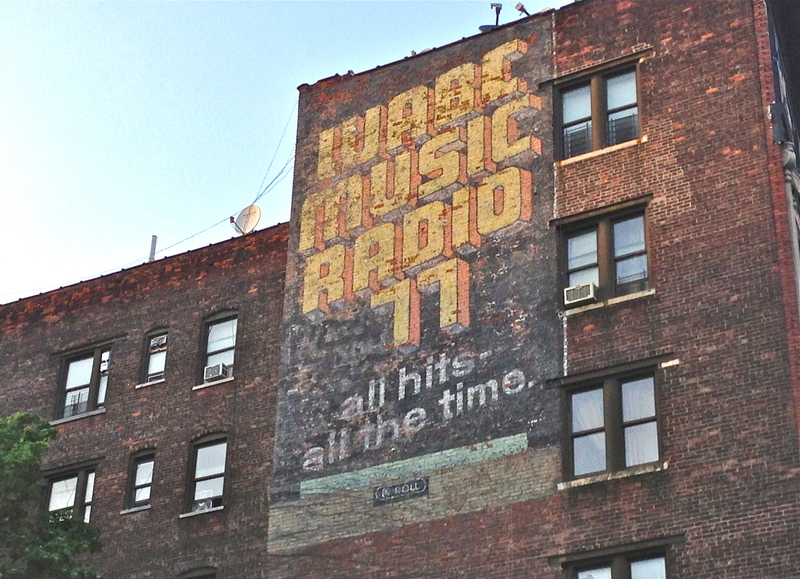 The 1970s Top-40 music scene lives on thanks to this almost perfectly preserved ad, on the side of a building at 145th Street and St. Nicholas Avenue. I’m guessing it went up in the disco era, when radios all across the metro area were set to 77 AM, then a hugely popular station. WABC is all talk today—it’s been that way since 1982.